Wilson College in Chambersberg, Pennsylvania has established the Robyn Van En Center in honor of Ms. Van En who died in1997. The Robyn Van En Center maintains a data base of Community Supported Agriculture farms, now numbering over 1400 farms, which is easily searched. CLICK HERE to search for a CSA farm convenient to your home using this directory. 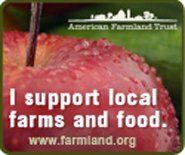 The Community Supported Agriculture directory of farms on this website provides information on CSA farms, which have a commitment to produce their farm products using organic methods, without the use of harmful chemicals, genetic engineering or any synthetics, and which show care for the health of people, animals, land and water. Please send information on CSA farms which meet this standard by visiting the contact us page.